Really great. You heard new album Evil? San Francisco’s finest are back with buckets of anti-Evil vengeance. 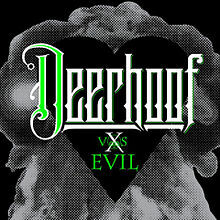 With no outside engineery-type help Deerhoof are a self-recording/self-producing force this time round. Released by Joyful Noise (among others) on cassette, packed with handbaked editing goodness, a collection with all varieties of nonsensical twinkly sonic innovation. Over the duration of several weeks each track was cannily leaked by the band over different sites, and after a good bout of surfing you can access them all from their hub. Straight off we’re treated to a flabbergasting range of sounds squeezed from guitars which sound like overworked (and underpaid) machines. Six strings act as cash registers and angry hair dryers, doing well to resemble anything but guitars on the glimmering opening track, sung in Catalan. The Merry Barracks is a sweet droplet of a Deerhoof tune and the album’s standout track. An inexplicably crude bassline begins while the rest of the band plain ignore it to proceed bashing out one of Deerhoof’s most perfect songs to date. Addictive hook, sweet harmony, free noise guitar solo – just perfect. And served up right after is another superlative: probably their sweetest, most heart-wrenching tun;, acoustic guitars a-winding, faint vocals, tender percussion… it’s here. Midway through we’re treated with a vicious cover of the theme tune to a dusty old Greek film whose name you won’t know and don’t need to. A shrieking, glittering delight, perfect clear guitar chimes a pierced line, chasing an abrasive riff. The album’s last third sees Deerhoof doing their best to write some convention into the tunes, with some beautiful instances of pinching a tight harmony at the ends of phrases. Irrelevance is on my mind. Explorations are interesting in themselves but it might give the impression of a breathless trip round an ingenious mini-golf club, a toy theme park and finally a sweet shop of red herrings. Did we fall into any catchy cobblestone steps on the way? You bet we did. What did we learn? Err, rhubarb and custard, liquorice… Plus a stomach full of smarties. Deerhoof do their job though serving their trademark sweet and sour, a dish delirious with saccharine rips of kitchen scourer. Disjointed, sloppy drum beats are the order of the day, the magic stick wizard Greg Saunier otherwise taking a back seat for songwriting to steer the album. All is in order but the deer and the hoof haven’t let go of their tedious habit of allowing an album to peter out as per usual in a weak mesh of synths and melodramatic vocals. Apart from some questionable diversions, a truly first rate, top mark, 5 sticky gold stars to slap on their progress report – and a big smiley crayon face – I am truly in danger of gushing at every sparkly track and not letting it to yourselves; Just like that sweaty taxi driver who never lets you get out and see for yourself – arms obsession hairy. You should be happy that there’s too much sweet Deerhoofy goodness that I haven’t mentioned.